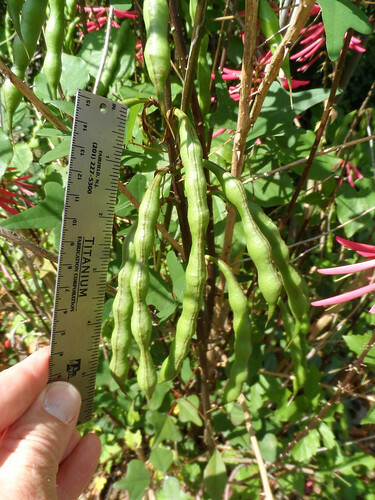 Dangers: plant must be cooked to remove toxins, do NOT eat the seeds or older, mature leaves. 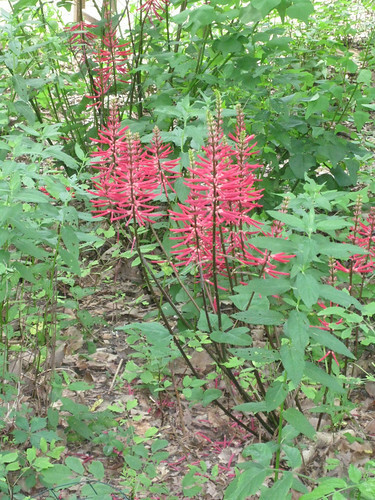 A young Coral Bean flowering in the spring woods. 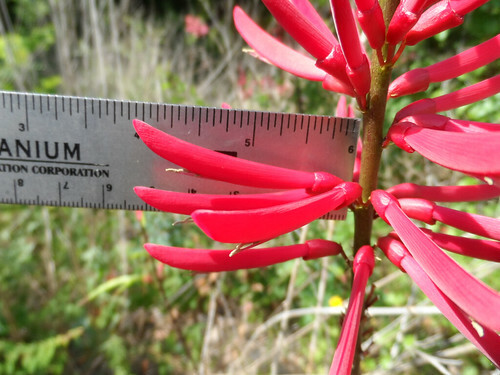 Coral Bean flowers in spring. 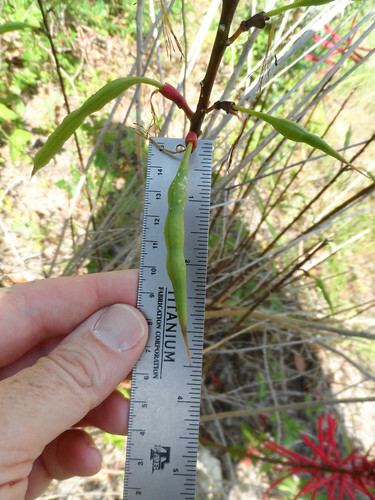 Coral Bean leaves, already too big to cook and eat. 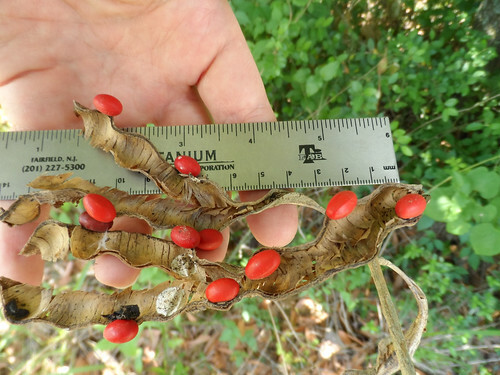 Coral Bean "beans", which are NOT edible. Dried seed pods from the previous year. 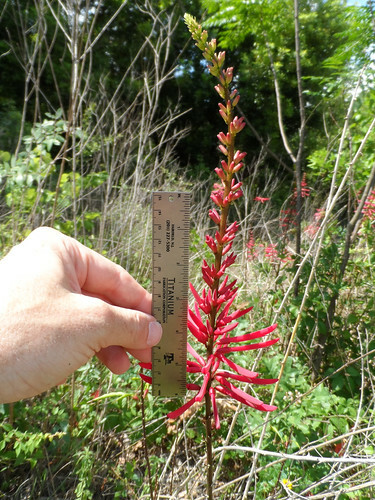 The bright red, tubular flowers of the coral bean bush make a distinctive addition to the Gulf Coast region spring colors. This leggy bush, if not subjected to a killing frost, can grow into a small, wide-crowned tree which is sometimes used in landscaping. Normally it is found as a clusters of bushes about four feet tall in open clearings of woods and occasionally in fields. It does best in sandy, well-drained soils such as those along rivers and stream but due to their preference for dry feet, they'll be back quite a way from the water's edge. If the winter was mild enough you are likely to find flowers, fresh green seedpods and old cracked-open seedpods on the same plant. 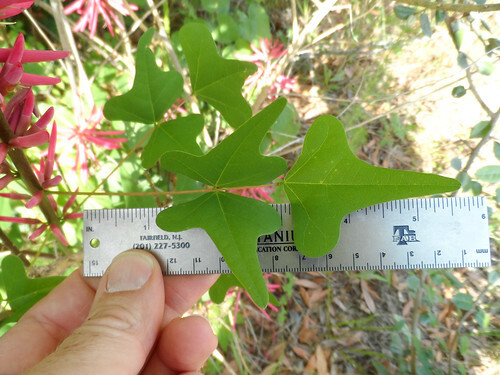 The spade-shaped, compound leaves grown in groups of three and have the neat feature of always being turned toward the sun, a process which is called "phototropism". 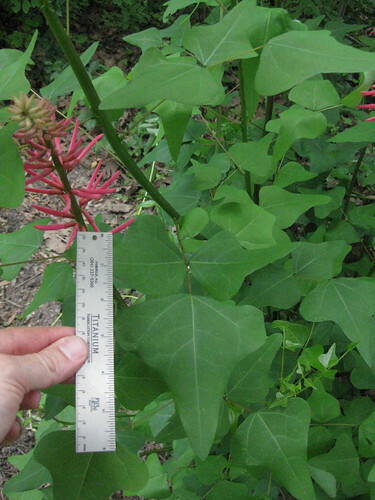 The only edible part of this plant are the red flowers and youngest leaves. Both parts must be boiled for 15 minutes to render them safe to eat. Cooking does shrink them the flowers and leaves down quite a bit so you'll want to harvest a lot...but never more than 10% of the flowers and new leaves so to insure the plant stays healthy and can reproduce. Stick to eating leaves 1.0-1.5 inches long, or smaller. The young leaves can also be boiled for a tea which some native tribes considered to be a general health tonic. The red beans can not be made safe to eat as they contain a poison similar to curare. 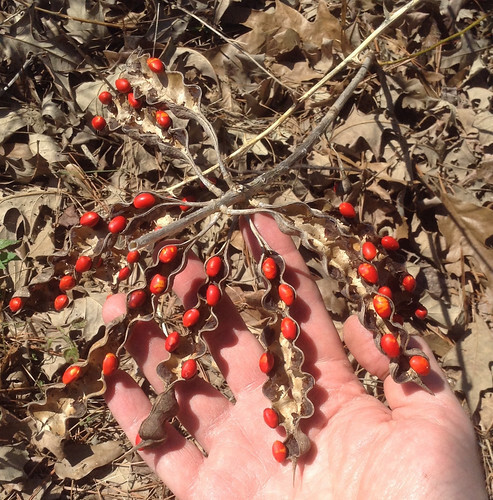 In Mexico these seeds are used to poison pest animals such as rats. Hummingbirds love the sweet nectar found in the flowers and are immune to the coral bean toxins. While foragers and hummingbirds may like this shrub, many other land-owners find it to be a somewhat invasive nuisance. 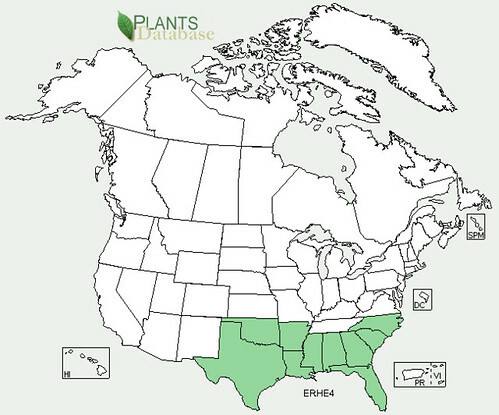 The plant produces many seeds which can cause it to quickly spread over an area, rendering it unfit for cattle or other domesticated animals.